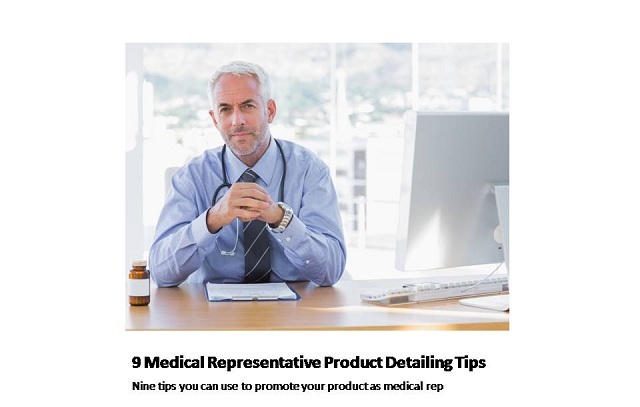 One of the secrets to succeed as a medical representative is successful detailing. It's an important step to convince the doctors to prescribe your medicine. In this post, you're going to look at tips to promote your product when you detail during your visits. When you visit your doctors, do you know what they expect from you? 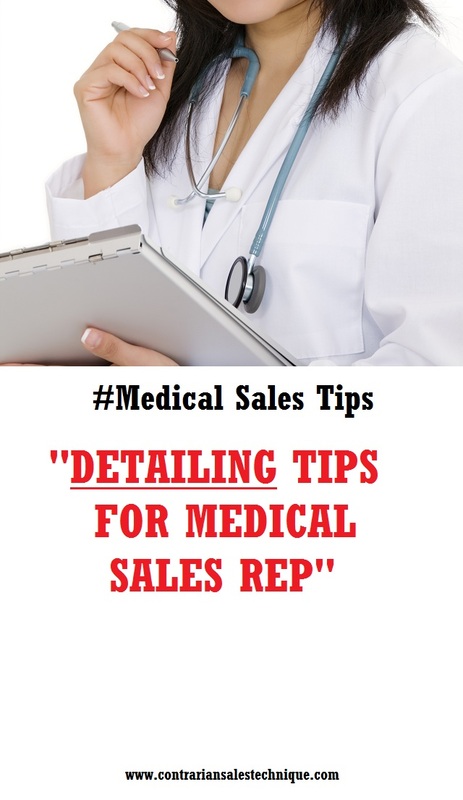 Detailing products is not the only thing you do when you meet your doctors but it is one of the tips for medical representatives for success in medical sales. How is the mechanism of detailing? To offer you a fundamental definition, it's a promotional activity done face-to-face with your doctors using materials like products brochures, and in today's pharmaceutical industry, using e-detailing tools like iPad, laptops or tablet PC to deliver key messages to convince the doctors to prescribe your medicine. 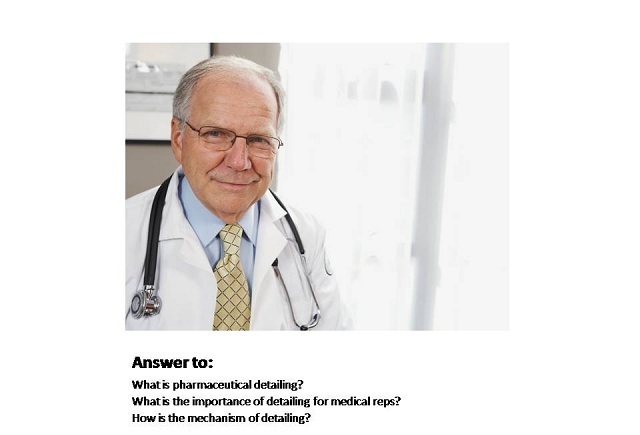 What represent the importance of detailing for medical reps? It's a part of their roles and responsibilities. It's one of those visible functions of being a rep, if you are one, which you are often being evaluated on. Some pharma companies go to the extend and make detailing as the exclusive thing that counts for. Reps are expected to promote and close in a pharma sales call. It's what generates the revenue, and revenue is extremely significant for the company you're presenting. First, you need to do pharmaceutical call planning. This is when you plan to meet what doctors expect from medical sales reps. Once you have done this, you'll have the idea what to bring with you during your visit to the doctors. Then you record the outcome from that interaction and you set objective for the next. As you can see, there's not much of secrets to succeed as a medical representative. 1) There is no right or wrong way to convince doctors: just what work and what do not. You can categorize putting it as the “old school vs. new school” method of detailing but the main point is which one works best for you. There’s very minimal value by having the latest sales strategies like SPIN Selling, SNAP Selling, Selling to Social Style (S4), Value Base Selling, Patients Focus Selling or what have you when simple talk, point to the brochure and ask for commitment achieve your sales objective just the same. 2) Ask yourself whether you’re in a long detailing or a short one. Depending on the type of pharmaceutical sales calling you’re making, a longer call requires you to detail more compared to a shorter one. It’s commonsense. A typical long call makes you go through the steps of asking questions, making initial benefit statement, checking for acceptance, validating your claim with studies, addressing concern and asking for commitment. A short call is achieved with just greetings and addressing key message(s) and schedule for another meeting. 3) Is it a technical or follow up call? Technical call could mean it’s the first time you call upon the prospect or customer and you need to take the time to introduce the company and product and go through a lot more details. A follow up call typically just a continuation on what you’ve discuss prior to that meeting (progressing into the sales cycle). 4) Are you seeing a decision maker or non-decision maker? Like it sounds, decision maker requires no stone left unturned for them to make the final call but non-decision maker likely need to be updated on the progress of the sales process or negotiation. 5) Are you in the GP (General Practitioners) or Institution selling? Some GPs require detail description of the product or service you’re offering. Most of the time, they absolutely need to know how big is their profit margin is but there are exceptions in certain cases. For Institutions, customers need to be furnished with more details but when it comes to carry out decision; you might need going a few layers before a decision can be made, with or without your detailing. Woefully, some Institution requires you to manage bureaucracy well. It’s just the way it is. 6) You want to prepare to best of your ability. Devour all you can about your product material which includes your Packet Insert/Product Info (PI). Ask your Brand Manager (BM) or Product Manager (PM), Sales Manager (SM) and whoever responsible to notify you about the product everything you desire to appreciate about the product and its’ associated issue. Make sure you understand enough to present to your prospects or customers. 7) Practice with those who know the product or customer. In detailing practice, this is dubbed “mock detailing.” You learn how to best present your piece, you get feedback, practice some more and then you go out to approach your customers. This might be unpleasant initially but after a while, you’ll get the hang of it. 8) Deliver the call and record your performance afterwards. It would be excellent if someone else undertake this with you since you’ll exhibit the tendency to overlook or miss your own careless habits like not pointing at a brochure with pen, etc. but do the best you can to record what you did well, what you entail to cease and what you require to maintain performing. 9) Polish your detailing and keep polishing it until you develop your own style. It will take some times before you achieved detailing mastery and that’s the reason why you need to keep practicing. You can never tell when company will amend your portfolio or improve your area or you change company for a more productive career and so on. No background check was done to the previous call or to look into customer’s past record to customize approach before the sales call. In the worst case scenario, wrong information or product was presented during sales call. It happens but it is easily avoidable. 2) Saying the wrong thing to the wrong crowd. Detailing messages are not relevant and they lead to more questions and they turn into customers’ losing interest. It’s a classical “send the duck to talk to chicken” kind of situation. If enough preparation was made before the call, this can be avoided without breaking a sweat. 3) Not reading the body language. Reps didn’t notice the signal to move or ask for commitment and did not interpret well the non-verbal cue that’s being transmitted by the customers/prospect. Reading non-verbal cue when detailing is as important as delivering verbal message, in fact, in certain cases, it’s more important to pay attention to the non-spoken message. 4) Fail to add value. No value was added in detailing due to trying to say too much in such short period of time of saying too little in product related issue when having longer time (spend too much time chit-chatting) and customers were lost in the conversation, and reps find it difficult to put them back on track. As reported by the latest survey that many doctors are spending less time with medical sales rep and most MR can’t really decide what to say when they got the opportunity to meet doctors face to face. 6) Ineffective use of detail aids or visual aids during detailing. For example, reps keep flipping brochures to find where the piece of information related to the topic discussed is located hence losing customer’s attention and interest (and patience too). Since many reps thinks that detailing is just a onetime event and it ends the minute they walk out the doctor’s room. They should know that doctors retention rate for products could be quite short because of interference with other pressing issue like patients well being and other medical products. They need to be reminded more than informed and that means ‘follow up’. 8) Don’t know when to start. For some reason, because many reps are very talkative about issue other than their own products, they keep on talking about non-related issue and talk very minimal or almost zero about their product key messages. They can talk for hours about movies, sports, travel and so on until they forgot that they are there to deliver important and relevant key messages to customers. 9) Don’t know when to stop. Some MR, even after being verbally reminded by the support staff that doctor need to attend to some other matter, keep pressing on what they have to say. It’s easy to fall into this mistake or the previous one. These are just the flip side of the same coin. 10) One way communication channel. This is also known as talking TO the doctors. Treating customers like a wall results in the same reaction from the customers. Customers find it easy to lose interest because they have so many other things to attend to. 11) Not checking for receptivity. Reps keep talking to finish the conversation fast and to go back home to their TV or they just want to make up their sales call numbers. This might be one of the easiest detailing mistakes made by MR especially when they work alone without proper coaching. 12) Does not validate claim/statement. This violates the ethic of evidence base medicine. Even we ourselves don’t want to depend on just public opinion whether a medicine can address our medical needs or not. 13) Assume customers know everything. This mistake causes reps to skip many important qualifying questions regarding the product they represent. Customers may know enough about the background disease and probably science behind the medicines but reps suppose to know more about how their product is relevant to customers’ practice. Don’t assume. Ask question. 14) Reps spill the bean too soon in a call. They did not build interest for customers to feel that they need to use what is offered. In a competitive pharmaceutical industry, building customers’ interest has become more and more important to make sure the drug position as the preferred medicine of choice. Habit like not pointing at brochure with pen, keeping detailing aids too close to them and other habits that can repel customer’s interest and attention to the message being delivered is also common. MR need to realize this habit and replace it with more positive habit. You can use this list as your medical representative success guide with 100% chance of working, if you put it to use, that is. Does the doctor expect very little from a medical representative? 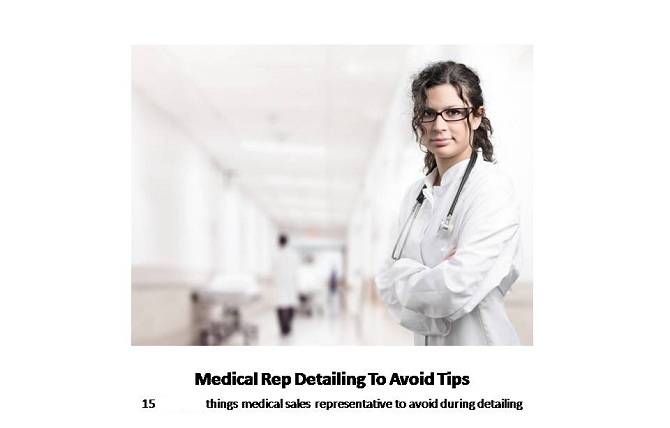 That's very subjective but for success in medical sales, these medical representative detailing tips can be very invaluable.